Like everything in Festival Country, our burgers are a little more festive. Check out these creations from some of our most creative burger chefs, which are listed in no particular order, so try them all. 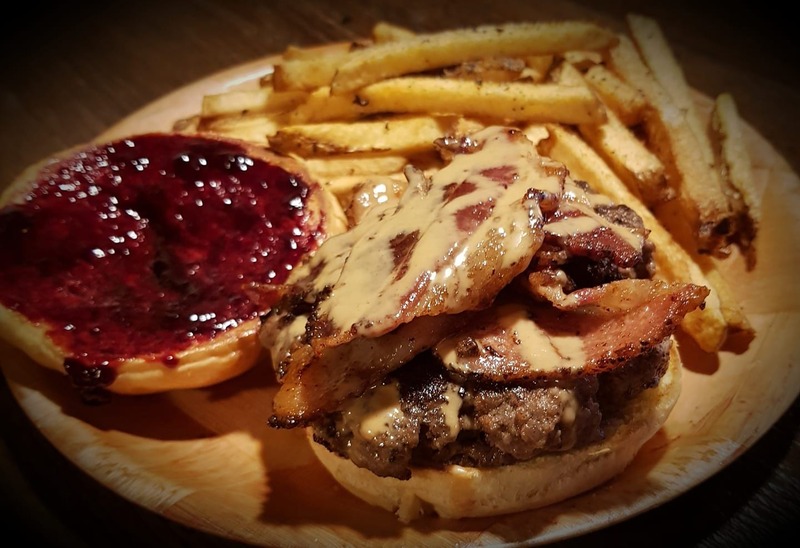 A delicious sirloin patty with peanut butter, thick cut bacon and blackberry preserves. Just as delicious as it sounds! 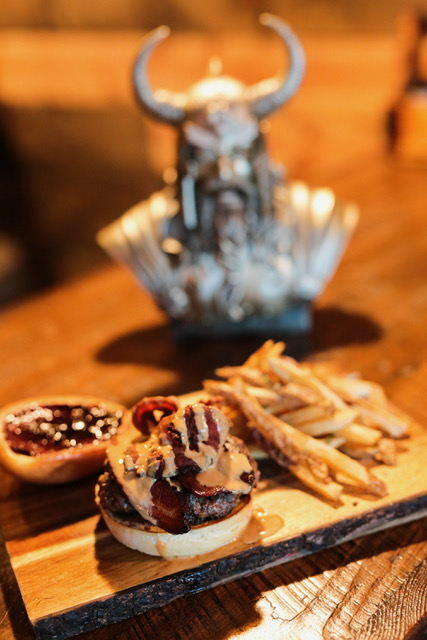 Check their menu for more amazing, one-of-a-kind burgers. Their fresh, never frozen burger is made with a top-notch blend of chuck, beef short ribs and beef brisket is seared with their signature burger seasoning then cooked to a juicy medium well. 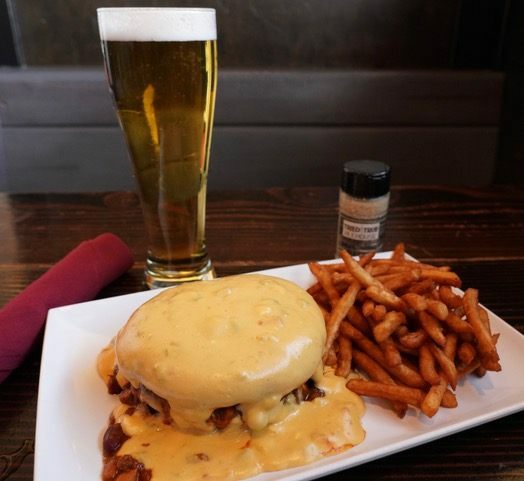 They then steam melt American cheese on the burger, then top that with their scratch-made, award-winning industry chili. But they are not done yet. They top that with a butter toasted brioche bun top, then smother that with their scratch-made queso cheese. It’s the perfect fall fork burger! This burger features white queso, pickled jalapeno, avocado, fried onion, house-made barbecue sauce, lettuce and tomato. Delicious! This 12-ounce triple cheeseburger features three cheeses (American, cheddar and pepper jack), bacon, ham, fried onions, fried pickles, grilled onions, jalapenos, green peppers and spicy ranch. Served on your choice of a traditional bun, grilled rye, grilled sourdough or a pretzel bun. A juicy, 1/3-pound black angus burger loaded with their signature pork, crisp bacon, cheese, onion straws and barbecue sauce served on a grilled bun. A 1/3-pound lean ground beef burger topped with bacon, barbecue sauce, cheddar cheese, caramelized potato straws and bacon dip on grilled sourdough bread. This creation starts with an all-beef patty (or chicken, turkey or vegan if you prefer) and is topped with sharp cheddar cheese, with creme cheese under the patty. From there, they top it with slices of applewood smoked bacon and crispy onion strings battered and fried to order. Finally, they add their house-made Bulleit Bourbon sauce, which is their scratch recipe. They add Bulleit Bourbon as the final ingredient to the sauce batch after it is prepared so you must be 21 to order this burger as none of the alcohol is cooked off during preparation. Served on a brioche bun. Most of the burgers on this list are true specialty burgers because they’ve taken the traditional burger and put a unique twist on it. This burger, however, is traditional all the way. But they do it so well that it earns a spot on this list. A classic burger topped with their own smoky BBQ, American cheese and bacon. A burger topped with sriracha limo mayo, guacamole and pepper jack cheese.